Buried in a New York Times article on "Low-Carbon Chic" (vomit) comes confirmation the Tata Nano, the $2500 (or maybe a bit more) mini-car will offer a MDI compressed air engine as an option. Tata has been backing MDI for a while now, and off-the-cuff we mused at the idea of the compressed air engine option in a Nano months ago. Given the novelty of the engine, it was more a dismissal than speculation. Well, we guess it turns out we were right. 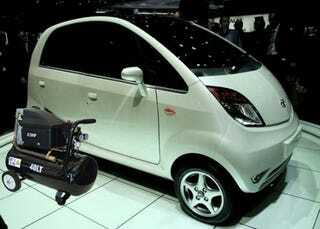 Remember after the Tata Nano was unveiled, how all the enviro-dweebs whined incessantly about how the huge swath of new little cars on India's streets would contribute bajillions of tons of carbon dioxide to the environment? Well, maybe they'll be eating some crow because $3 worth of electricity will probably fill a tank for a 125 mile trip. This news comes as something of a game changer for the Nano. Before the car offered bare bones transportation at a cheap price. Certainly a strong selling point, but with skyrocketing fuel prices, the gas has become as much a barrier to market entry as the price of the car. With the incredibly cheap fueling cost on compressed air the car becomes even more accessible to an even wider audience. Forget all that for a moment though. This kind of makes us wonder what the point is of billions of dollars being invested in lithium-ion batteries, hybridization, low rolling resistance tires, aerodynamics, hydrogen fuel cells and all that other malarkey. The issue with all of the highly touted alternative fuels is capacity or distribution. Hydrogen fuel is expensive to make, has no distribution network and it would be expensive to implement one. Electricity generally comes from coal-fired power plants at the moment (in the US), charging stations don't exactly litter the landscape, and even it they did, it takes forever to charge the batteries.